Kwao Kreu Kao (Pueraria Mirifica) Kwao Krua Dang (Butea superba) ... a natural herbal health and anti-aging elixer from Thailand . . .
destination holistic health resort-spas like the Chiva Som in Hua Hin, Thailand. It is widely known that Hollywood celebrities and others in their quest of a more youthful appearance afford synthetic hormone treatments that imitate the human hormone estradiol. Kwao Krua Kao from north Thailand and Burma is the only known plant scientifically proven to contain a natural organic Miroestrol 3,000 times the potency of phytochemicals contained in grains & other botanicals. It is known to be a breast, prostate & colon cancer preventative based on the scientific studies of the extremely low incidence of cancer among the ethnic villagers who have used it as a herb tea health drink successfully for generations. Read more inside about the ancient hilltribe native peoples Fountain Of Youth root bulb folklore herb known as Kwao Krua Kao (Pueraria mirifica) & (Butea superba) It softens skin, removes wrinkles, & replenishes humans with natural phytohormones. Expect a marked improvement in energy levels in a period of 1-12 weeks and a new youthful look and feel with Kwao Krua Kao (Pueraria mirifica). Kwao Krua Dang (Butea superba) is even more powerful with its combination of natural phytosteroids rendering it a male energy health vitality supplement. It contains flavanoids, flavanoid glycosides, organic steroids, organic steroid glycosides, and organic carboxylic acids.The rejuvenating power of the red root bulb tuber is more potent than that of Pueraria mirifica. 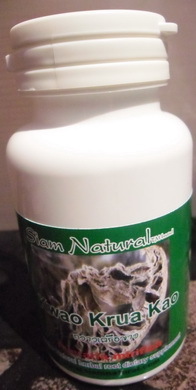 Thai villagers in their middle age and over use this herb to regain physical and mental strength. Benefits include: smoothing of skin, wrinkle reduction, superior eyesight improvement, marked memory improvement, and is an organic alternative anti-erectile disfunction agent. Traditionally, both men & women villagers drink a brewed tea daily made from both white and red root bulb powders as their Founatin Of Youth health elixir. 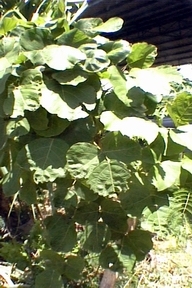 Local communities in Thailand have used Kwao Kreu Kao (pueraria mirifica) for generations for its rejuvenating qualities. In May 1931, Luang Anusan Suntara published a pamphlet on the subject of kwao Kreu describing different ways of preparing folk herbal remedy using Kwao Krua (pueraria mirifica) and the claims of it's rejuvenating power. • Serve as the fountain of youth for aged men and woman. • Serve as a anti-wrinkle agent for aged and wrinkled skin. • Darken white hair and increase hair growth. • Help with memory loss. • Increase energy and vigor, more reflexive bodily movements. In 1932, Dr. A.F.G. Kerr, the Director of the Botanical Section of the Journal of the Siam Society, directed the attention of the scientific community to the fact that the tuberous roots of a Thai plant called Kwao Krue originally mistakenly identified as Butea Superba, were considered to be of value as a rejuvenating herb. 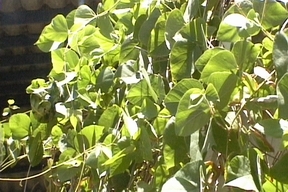 Dr. Kerr was the first to create international awareness of the rejuvenating qualities of this plant which subsequently led to the isolation of a potent phytoestrogen that is unique to this plant and to the identification of the plant as Pueraria Mirifica in 1952.